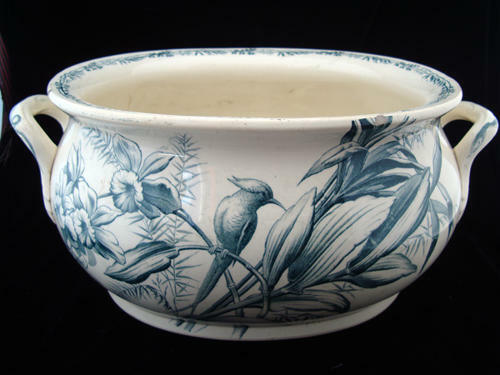 This large Victorian foot bath is transfer printed in dark green. The printed transfer pattern features huge Daffodil flowers and wild Grasses and a tropical Bird of Paradise. The pattern repeats on the opposite side. Spectacular image to the inside. Sturdy applied loop handles on each end of the large bath with rare Snakes printed on each. 17 1/2 inch long x 13 inches wide x 7 1/2 inches tall and a weighs 9 1/2 pounds. The piece is in good condition. Two old small chips along the rim and two under the base.